Dominic’s life was drastically changed eight years ago when he was released from prison after serving time for the accident that claimed his best friend’s life and in return destroyed his future. Traveling through the neighborhood on his way home, rain falls which forces him into a church and an encounter with an old priest who knows his family. 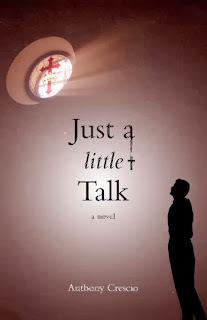 Together, they relive moments of Dominic’s past which brings up questions about his beliefs in God and Jesus. Ever feel like you have just failed everyone you love and there is no hope? That is how Dominic feels when he gets out of jail. Afraid to face his family, afraid to find out all that has moved on beyond him while he was away. He meets an old priest who ends up being much more. Dominic has an enounter with the creator and it changes him in ways that only God can. A great book to show that God meets you right where you are at, and can use extreme circumstances to do so. This was a small book with a big message. Anthony Crescio grew up in the small town of Randolph, Wisconsin. In the winter of 2009, his best friend lost his life in a tragic car accident as a result of drinking and driving. Anthony has since been inspired to speak to youth groups in the hopes of preventing other similar accidents from occurring. He has also started writing books reflecting on his life story and delivering a Christian message of God’s mercy, forgiveness, and love. YES, I sure have felt that way. I would love to read this book!